Browse these categories under "Big Game"
The ATD Platinum TwinDragÂ® is the Flagship series of the Accurate line. Designed with Accurateâ€™s patented TwinDragÂ® feature to deliver smooth, powerful drags, the larger ATD models put out in excess of 100 pounds of drag for targeting giant Bluefin Tuna and Marlin. These reels have been internally designed to handle high drag loads by applying an even amount of pressure on both sides of the reel with two synced dogs to provide the ultimate stopping power. The ATD offers a smooth, even drag that is consistent through the fight with little to no start up inertia, alleviating the possibility of high drag spikes when line comes off the reel. If you are looking to harness the ultimate stopping power for big game fishing, the ATD is the finest reel on the market of its kind. The Penn International V-Series raises the gold standard for offshore anglers. Penn International V Reels offer the most advanced and reliable fish-fighting performance in the world, with an ergonomically designed, contoured, one-piece machined frame, and unbelievable cranking power and strength. The PENN International VI series is designed and manufactured in the USA of domestic and imported components. Precision machined from high-strength, lightweight, aircraft grade aluminum in PENN's Philadelphia machining center. PENN's experienced crew has been designing and producing durable, high-quality reels in this facility since 1932. The Shimano TLD-IIA Reels are powerful, light and durable can quickly describe Shimano's new TLD 2-Speed lever-drag reel series. 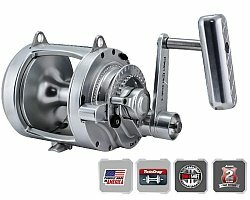 Each Shimano TLD-IIA reel features Shimano's patented 2-speed shifting mechanism and A-RB anti-rust bearings, along with unique handles to provide comfort and fish-fighting advantages. The A-RB bearings provide the corrosion resistance needed for saltwater use, plus anglers will appreciate the cranking ease of the ergonomic Power Handle on the 20 and 30 size reels, and the offset ergonomic Power Grip on the 50 size reels. Construction features on all four reels include stamped graphite frames, graphite sideplates, an aluminum spool, a loud clicker and rod clamp. Shimano Tyrnos Saltwater Trolling Reels feature an open top crossbar design and Shimano's stainless steel A-RB anti-rust bearings. Other key features designed primarily for trolling are a ratcheting lever drag to eliminate any lever movement caused by boat vibration and a loud clicker with enough tension to hold large baits. Additional features include oversized gears for power while maintaining a high-speed 5.0:1 gear ratio, and an extra long handle shank with an oversized ergonomic rubber power grip. Shimano Tyrnos reels are constructed with diecast aluminum frames and graphite sideplates to reduce weight while maintaining strength and durability. Shimano Tiagra Reels are widely accepted as the ultimate offshore reels by captains worldwide because of their durability and superb performance against the biggest and baddest fish in the ocean. With the introduction of the newer Shimano Tiagra "A" series of reels, an improved ratcheting lever drag was introduced, allowing for more precise drag adjustments along with an improved 2-speed gearing system. Shimano Tiagra "A" Series Reels (Tiagra 12 and Tiagra 16 excluded) received an offset ergonomic power grip that gives anglers more leverage.